169.254.x.x is known as an Automatic Private IP Addressing (APIPA) address. As of Windows Vista, ALL devices must have an IP address so Windows can’t find a DHCP server and you do not force a static address, it will automatically assign itself a 169.254.x.x address. Option 1: Right click on 169.254.x.x in DHCP and select ADD/REMOVE BINDINGS and make sure your DHCP is set to use the correct NIC. Option 2: Disable all of the NIC’s you are NOT using. After all of these options, you likely need to reboot the server to clear the caches and have the change take hold. The solution for me was OPTION 2, disable the unused NICs, but as you can see in the screenshot I had a really weird situation. If I launched the DHCP applet from Server Manager, it would show the host name like it is supposed to. 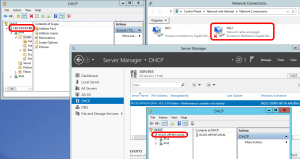 I had it fixed but found I THIS MS post does a good job of discussing this DHCP issue if you want more information. Yeah. Option 2 is the thing. Amazing~! thanks for the help . just disabling the other NIC’s fixed the problem . Me funcionó la opción 2. Gracias.